Features roasted dandelion root, the celebrated liver cleanser, and burdock root to help support healthy liver function and digestion while detoxifying the skin. 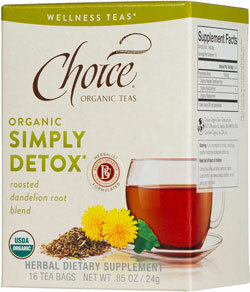 I often drink Choice Organic Teas, but I have never before tried their wellness formulas. Tea is such a comfort when you are ailing. Not only does it provide warm, emotional comfort, herbal remedies reduce symptoms and aid recovery. Of course these teas are organic, produced with wind power, and packaged in a 100% recycled, 65% post-consumer box, like all Choice Organic Teas. In addition, a portion of profits supports the Bastyr University Student Scholarship Fund, the largest natural healthy university in the US.